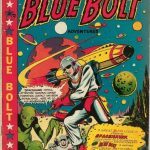 The comic book portion of ComicLink’s Fall Featured Auction ended Wednesday December 2nd and there were definitely some interesting results. The CGC 6.5 Wonder Woman #1 emerged as the strongest comic in the lot finishing at $34,000. A Hulk #4 at CGC 9.6 tied for 2nd with a CBCS graded 9.0 Tales of Suspense #39. 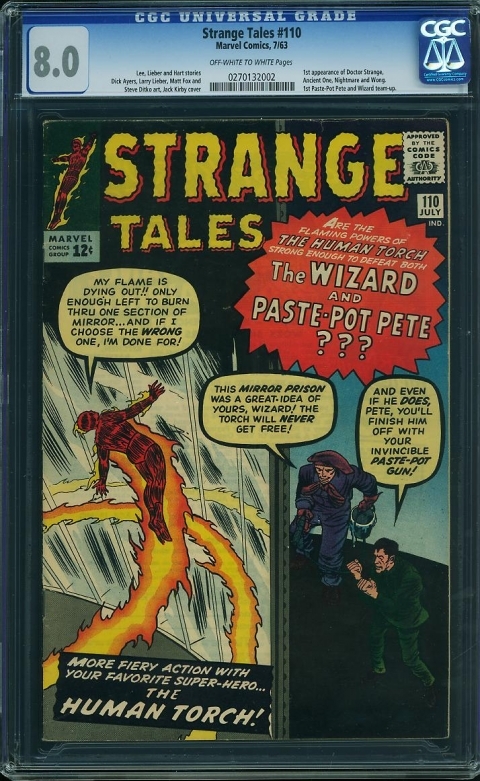 It’s perhaps important to note that the CBCS 9.0 copy of Tales of Suspense #39 sold for more than the last recorded CGC sale ($24,944 – though that sale was over 2 years ago). OK now to some results. Wonder Woman #98, DC Comics, May 1958 Graded by CGC at 7.0 with Off-White pages sold for $5,100.00. Holy cow, this is a super strong result. I knew this book was already hot when I picked it as a recent Undervalued Spotlight but this result exceeded my expectations. There are few titles hotter and Wonder Woman issues from this era are so tough. This is a key issue and there are not that many that grade above it. $5,000 might seem like a bargain a few years from now. BTW this very copy sold in 2012 for $233. Nice return. 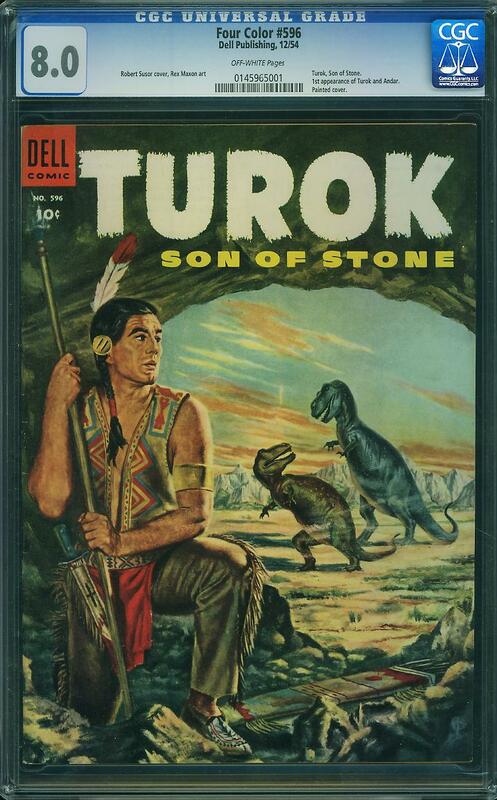 Four Color #596, Dell Publishing, December 1954 Graded by CGC at 8.0 with Off White to White pages sold for $951.00. I ticked I missed this one, had it marked down early but forgot about it when it mattered. 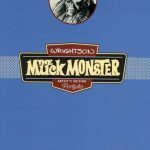 This still such an undervalued book, picking up a CGC 8.0 for less than a grand seems like a steal and it is. Super Goof #62, Whitman, November 1980 Graded by CGC at 9.4 with White pages sold for $1,008.00. 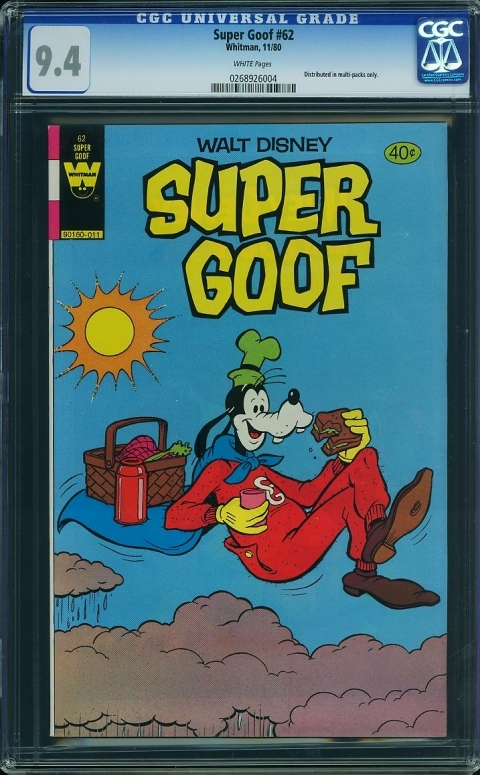 There are some things I still don’t get, like how does a book from the 1980 that nobody is remotely interested in get over a $1,000 at only a CGC 9.4? Maybe it’s the fact that it was in those now scarce Whitman multi-packs? Don’t you have to take them out of the multipacks to grade them? I think the solution is to slab the whole multi-pack! Strange Tales #110, Marvel Comics, July 1963 Graded by CGC at 8.0 with Off White to White pages sold for $7,255.00. I was watching this auction with some interest because I’m still high on Doctor Strange turning into a top tier property for Marvel. As far as I’m concerned all the ingredients are there. The book seems to have plateaued but that is not necessarily a bad think for someone with a little patience. 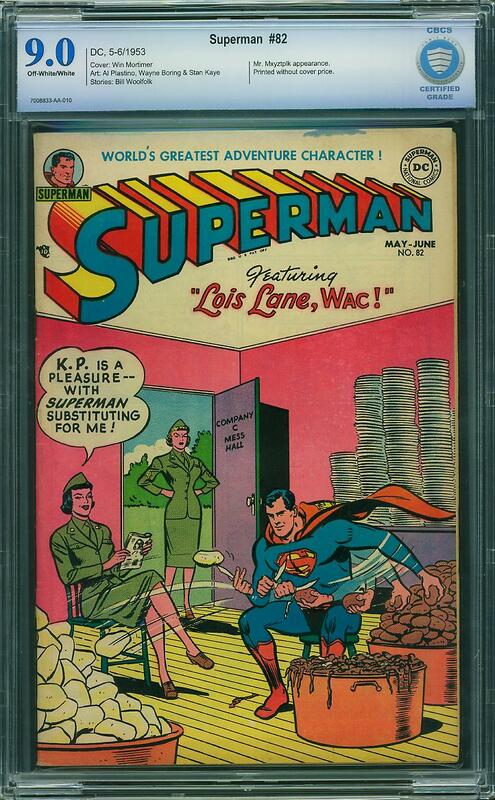 Superman #82, DC Comics, June 1953 Graded by CGC at 9.0 with Off White to White pages sold for $1,925.00. I think I’m trying too hard to figure a result like this out. Not many people are filling out their runs anymore. Even less are filling out Superman runs. So it must be the fact that this is the highest graded copy. That’s not a good reason to buy a book, especially one that doesn’t have that many graded to begin with. A lucky CGC 9.2 on a batch arriving some time next month could spell trouble for this result. 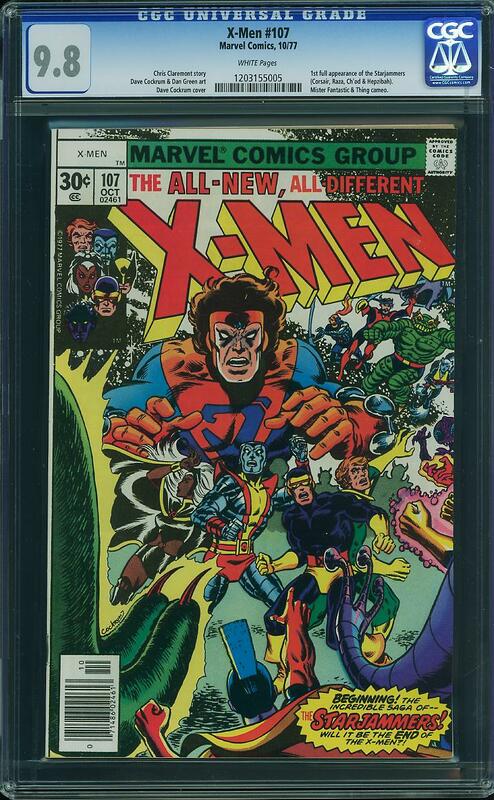 X-Men #107, Marvel Comics, October 1977 Graded by CGC at 9.8 with Off White to White pages sold for $3,011.00. 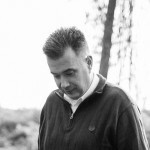 I mean here we are all of us trying to figure out the next big thing, keeping our ears to the ground for the next big rumour and wham! From out of nowhere we get his with this X-Men #107 result. Issue #106 in CGC 9.8 just before it got $700, a CGC 9.8 of our #107 got $725 two years ago. So what happened? So? You pick up anything? What did you think of the auction overall? Those Whitmans are a bit of scam. At one point, Overstreet denounced them as worth less reprints but did a 180 in later years to say that they held value. Best I can figure is that a bunch of retailers were hoarding those books and simply decided one day that they were worth something after all, which worked out great… for them. Never really understood the Four Color series. Every issue is different… and all comics are four color any ways. An very odd title. X#108 must be one of those situations that sellers dream about… 2 or more people who want the book really bad and are willing to pay what ever it takes. I feel compelled to respond on Superman 82. (I think I followed this copy when it sold raw on eBay, and the return looks like 100%+.) The price is high but not outrageous. According to GPA, #81 in 8.5 sold for $1.3k in 2009 , 83 in 7.0 sold for $1k in 2011, and a double cover 7.5 of this issue sold for $3.1k (!) this past August. For the book itself (which is basically reduced to a single piece of art due to encapsulation), it has a great cover – good composition, unusual color scheme, ridiculous subject, and Lois Lane. But most important is the scarcity of the core DC character books in this period. It is clear from the census that the ~1953-56 period is the nadir of supply. 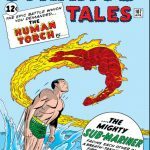 If there were many more high grade copies out there, I think these four-figure sales from five or more years ago would have brought them out of the woodwork. High grade raw books from this period sell in the high three figures just based on cover scans. I am fascinated by this scarcity mainly because of its cultural origins, and as a collector I think this scarcity is still “undervalued”. 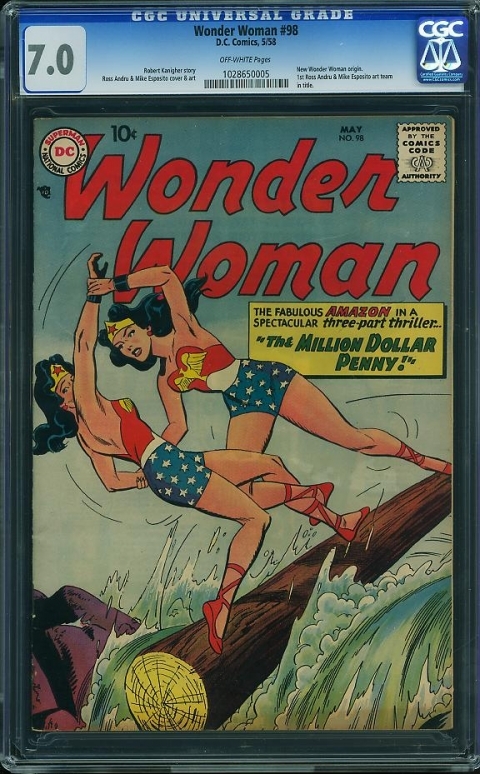 I didn’t pursue this book, but I did pursue the Gerber 6 Wonder Womans in this auction. I was slapped down on 81 highest graded (I should have had the stones to go higher) and 82 highest graded, but managed to come away with 83 second-highest graded. I doubt that after 15 years of CGC that many more high grade issues of any Batman/Superman/WW books from this period are going to come to light. (Maybe we could have a side bet on that 9.2 – you pay me 1 every year that it doesn’t show up, and I pay you 10 the year it shows up.) 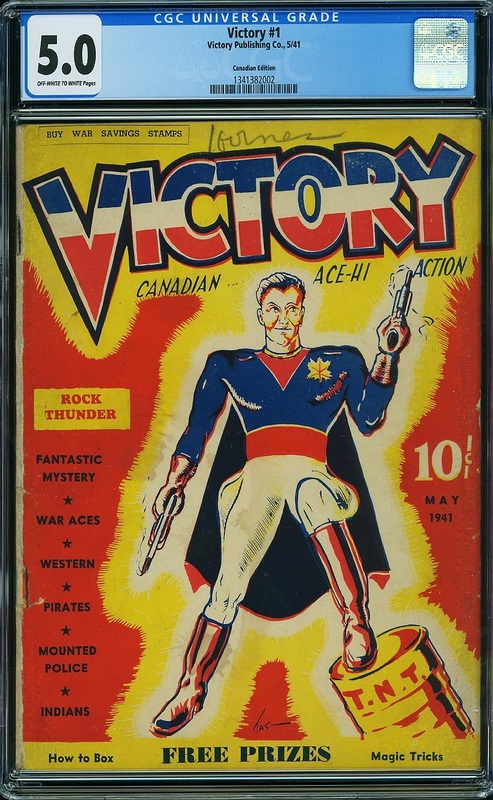 If people ever appreciate how scarce these issues are relative to mid/late forties golden age books, I think there is room for appreciation for anything >=CGC 6.0. On a related front I felt some CBCS resistance in this auction, but I’m not sure if that is just due to my bias. The Superman 82 certainly bucks that trend. 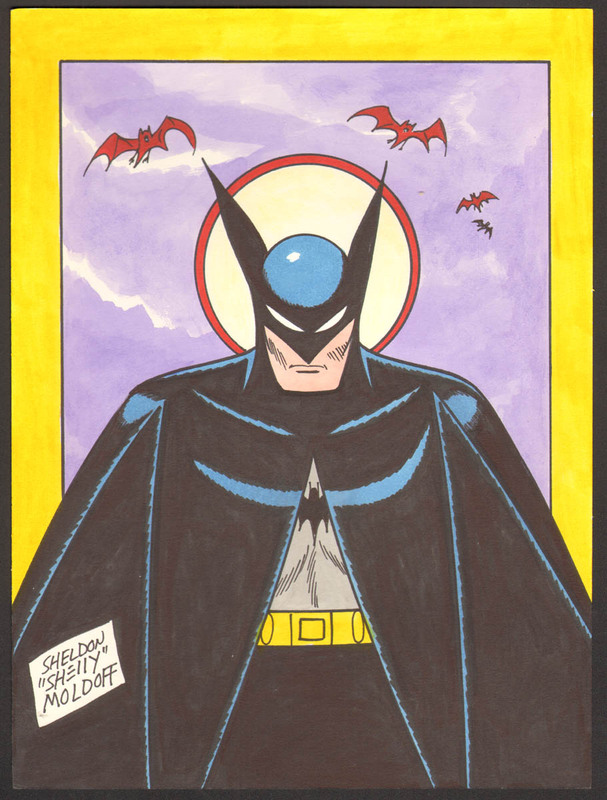 I was very interested in Batman 107 CBCS 8.5, which I think went for a bargain price if it had been CGC, but I was afraid to touch it. 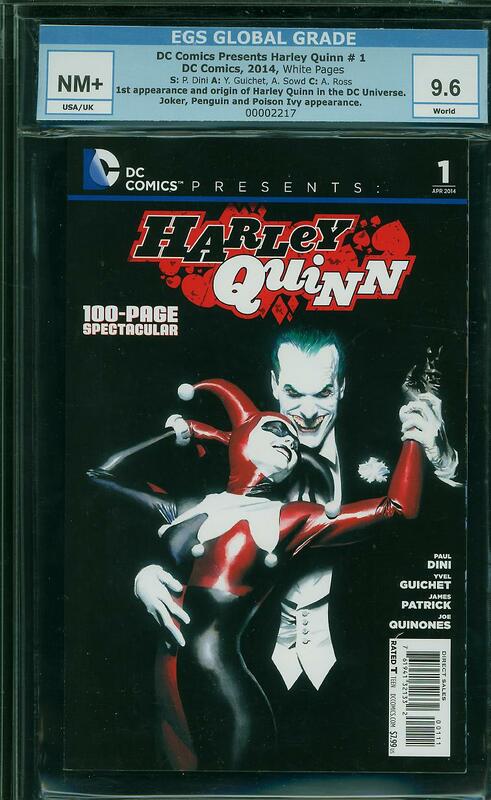 Given how new CBCS is, the relative number of high grade/”highest graded” CBCS copies gives me pause. It doesn’t help that ComicLink advertises these as “HIGHEST CGC GRADED!! !” in some of their item descriptions. Thanks for the comment Chris! I agree with your scarcity argument though I will say they are getting less and less scarce with each new encapsulation. The trend I think I focused on was that of the gradual decline of “run books” and the explosion in value of “key books”. As far as a friendly wager? Lets just agree to give each other props, I tend to lose all monetary bets I make. The CBCS issue is real, there is caution out there for sure, probably prudent at this time. Agree on the Whitman’s Charlie, scam! The Four Color run is so all over the map that I don’t think it’s the title, the focus for that book is Turok’s 1st appearance. That X-Men #108? 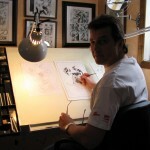 Was there any recent Starjammer news? Walter, thanks for your response – with my return to this hobby, you are my guru based on your track record of insights. I think that there are run books and then there are “run books”. Superman peeling potatoes in Superman #82 is the former, but so are most Marvel Mysterys. At a certain point of scarcity/demand, every issue is a unique property, regardless of its content. 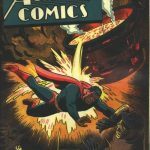 Superman from the early sixties on is generally “run books”, but I don’t think any book from the scarce mid-fifties period should be viewed that way. What you say is true Chris, not all “run books” are created equal. I’d sure love a Timely Cap #22 in my collection. And yes, most of the exceptions seem to be the scarce eras of titles and characters that still hold weight today. Thanks for the post! That Xmen 106 result is crazy. There must be thousands of equally high grade raw copies in existence. Also, I must disagree on the Superman result. That is one sweet book. I doubt it remains the highest graded as I believe there to be lots of ungraded late golden aged collections out there. Hope I’m the one that finds them! I was one of the underbidders on that X-Men #107. It’s a really tough book in the grade and page quality. Heritage has sold a few all north of $3k so no surprise there. This one has obviously been pressed — and not well, so I passed on it. Thanks for the info David. I did not realize this was so prized at the 9.8 White level. I have a 9.6, hope some of the value spills over.